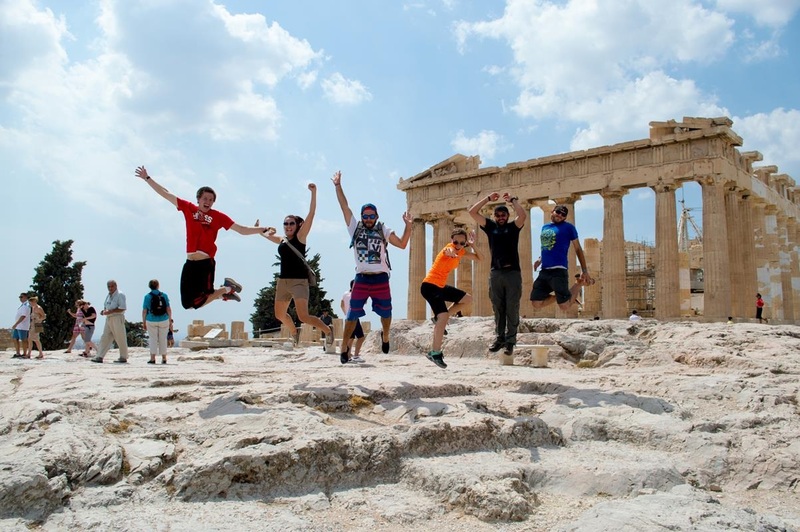 There were mixed expectations from the group of what Athens would be like. A few people were expecting nice sandy beaches and probably what a lot of the islands off of Greece look like. 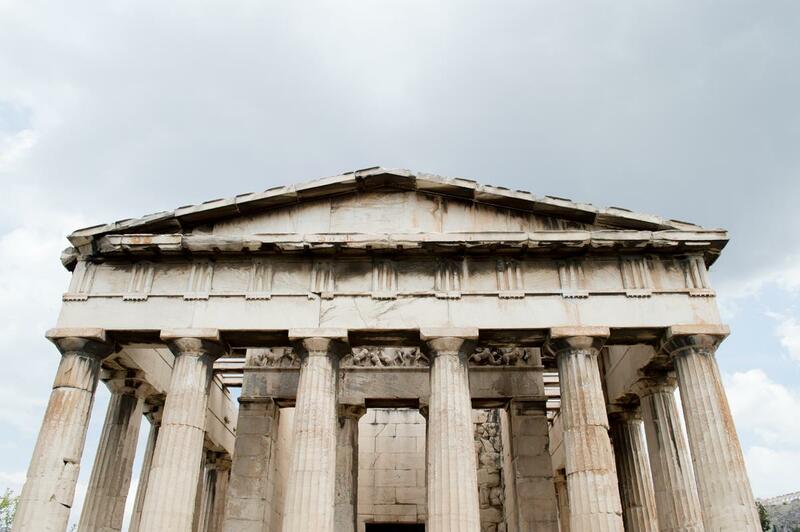 We’d heard that Athens is a dirty city, but the ruins are amazing and that’s pretty much how it was too. The culture in Greece is very strong and fun to experience for the most part. We arrived to our Airbnb and everyone spread out to pick rooms. Our host went over instructions and one that stood out particularly to the group was to absolutely not flush the toilet paper. This wasn’t a new concept to the majority of the group that when there are old pipes for the toilet no tp is worth the risk of clogging it up. The other fun detail was that the handle to flush the toilet needed to be pulled at least a few times if not more to get it to flush. Not nearly the worst toilets we’ve had to use and there was even a bidet if anyone wanted to skip the toilet paper idea altogether. Connecting two of the bedrooms was a balcony big enough for a group of us to sit and talk. With the busy city street down below and the lit up apartment rooms across from us we had all kinds of entertainment. We watched some guy trying to climb on the outside of the apartment trying to get to someone else’s room, and were thankful when he gave up and returned to his own room. We saw one guy who seemed to be walking around naked and I was reminded of the TV show Friends. One night when I was getting ready for bed I saw a guy with a camera across from our apartment. We turned the light off in our room to get a better look and it looked like he had the camera pointed directly at our windows. With that creepy thought we attempted to go to sleep. However, with the combination of the heat, the noisy cars in the street below and both of us coughing it was a sleepless night. 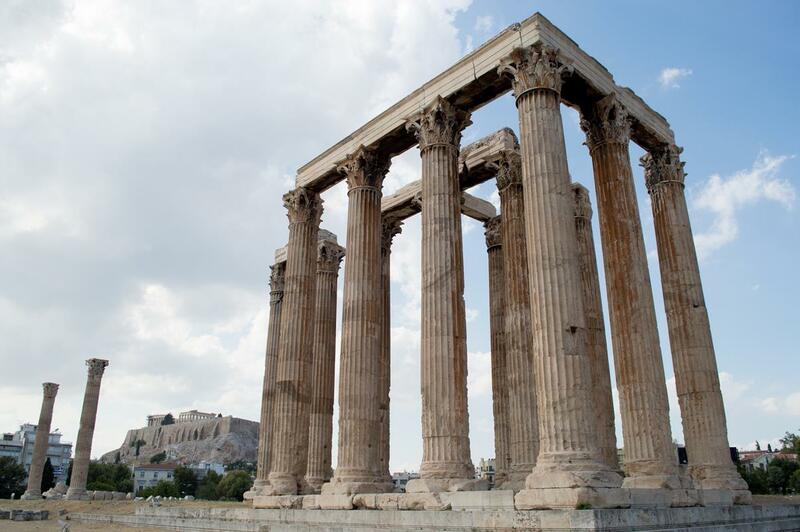 If you’re only planning a few days in Athens, it’s easily possible to see all of the ruins and tourist spots. We had two full days there, the first one we were able to visit everything we wanted to and then the second day we went to the beach. The day we arrived in Athens allowed us half a day to walk around a little at night so it wouldn’t hurt to give yourself an extra day if you decide to visit all the ruins and want to leave yourself some time for the beach. On our day in the ruins we visited the Theatre of Dionysus Eleuthereus, Odeon of Herodes Atticus Theatre, Erechtheion Temple that was dedicated to Athena and Poseidon, Parthenon, Temple of Hephaestus, Temple of Zeus and a few more spots that aren’t as worthy of mention, but still cool. All of these cost to enter, but we bought a pass for €12 that allowed us to enter all of them (the Acropolis and 6 archaeological sites that are must sees in Athens are what’s included). One spot that wasn’t included in our pass that we wish had been was the Panathenaic Stadium where the first Olympics were held in 1896. We were able to see the Stadium from the outside though and we didn’t want to pay more to walk in. We decided that racing in front of the Stadium was the best way to honor being there so we raced and scared a lot of tourists around us who had no idea what was going on. Overall the ruins are amazing to see, but I was sad to see how torn down they were. One shouldn’t expect a lot to be left over after such a long time with all the wars and destruction that went on. Reconstruction is being done to the Parthenon and other parts of the Acropolis to try and restore the beautiful structures, but it would be amazing to get a glimpse into what it all looked like in it’s prime. Do you know what a normal pose is? Well apparently our group doesn’t know and doesn’t care to do normal. While we were walking around the Acropolis in front of the Parthenon we wanted to take a picture of us doing hand stands. The guard yelled ,”Normal poses only!” and came over to stare us down until we walked away. We weren’t exactly sure what to do after that and she seemed to follow us around the Acropolis for a while. Since it was Amber’s Birthday while in Athens we celebrated the best way the Figueroa’s know how to celebrate; cake and a movie with everyone squished together. While Jef and Amber were celebrating by eating at a fancy restaurant whilst smashing fancy plates with shouts of “Opa!” we were busy picking out a cake for her. Little did we know until they returned to the apartment that they’d gotten 2 cakes as well! All the better. We watched Disney’s Hercules movie, bunched together and on sugar highs. Unfortunately there are a lot of people (usually women and children) trying to get anyone to take a rose from them. We already knew the trick, they stick a rose in your face and then if you take it they ask for money (usually a large amount). However, I’ve never had people be so in our faces about it. We were eating outside at a restaurant and the woman wouldn’t quit. Once she stuck a rose in someone’s shirt that’s when we really got annoyed and told her to go away repeatedly until she grudgingly left. I’m not picky when it comes to beaches, I just don’t ever want to swim at a nasty beach with garbage in it or a beach by the marina. We were told of a nicer beach that was about an hour from our apartment in Athens and we were all glad we went because it was a lot nicer beach. (The one close to us was disgusting, but that’s not surprising because it was by the marina). 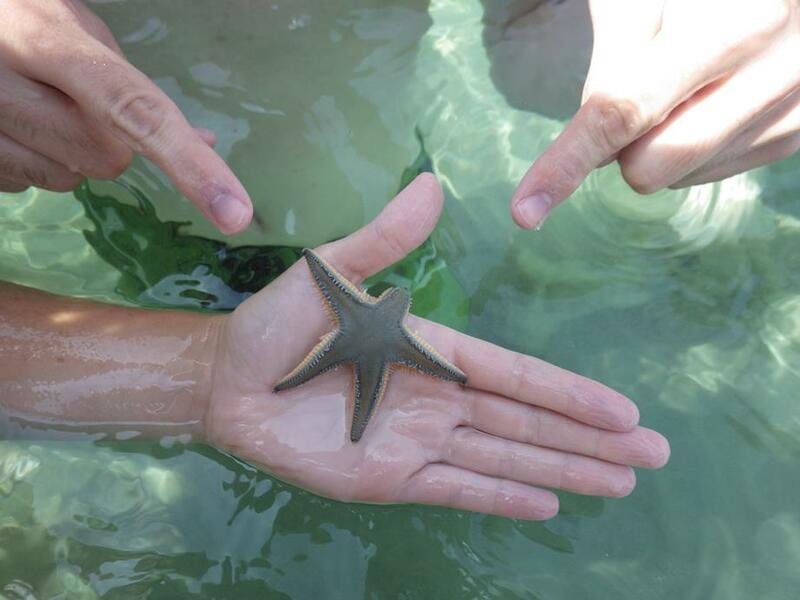 We made friends with a starfish (Patrick) before returning him home and relaxing in the water. Afterwards we ended the day perfectly with more gyros and Greek desserts. Which would you prefer, the ruins of Athens or the paradisaical islands of Greece? BEST DAY EVER! I loved our day in Athens. What I would add is a trip to Santorini Island. 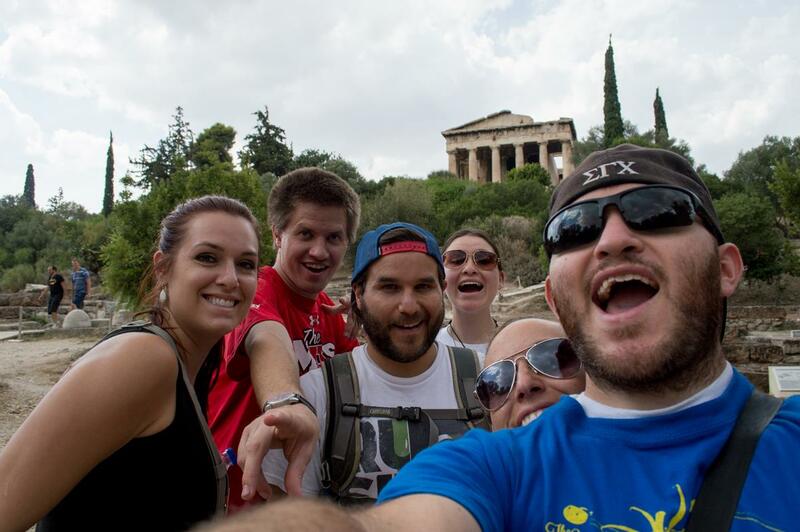 I have no regrets about our 2 days in Athens and so fun to join the Adventurousfigs for a few days of their journey. Santorini is definitely on the bucket list, but I agree it was nice to visit Athens. I’m glad you got to join us!